No matter what you call it there are many researchers at ODU doing research that includes consideration of the earth’s climate, how it is changing and the effects of those changes. With the establishment of MARI I was interested in the amount of climate change science research being done by ODU researchers. To facilitate collaborative or individual research at ODU we need to know what each other is doing. I used Google Scholar search using “Old Dominion University” “climate change” for the year 2013. I know that is restrictive but it is a start. With the Zotero connection installed I ingested the search results (page by page) into Zotero. I then exported the results to Endnote. . I tried to look at each paper to see if it really mentioned climate change. Note a chapter in an edited book may be erroneously flagged when another chapter has the 'climate change' phrase. Finally I exported the file using the format “APA 6th&rdqu; modified to include all authors. Disclaimer — I know I may have missed some papers and some may not be appropriate. I also probably missed papers read at conferences. The results are availbale here. You only need to scan the titles to see the rich diversity we have. During the period from January to June 2014, the Mitigation and Adaptation Research Institute was announced at the Tech Surge event. Larry Atkinson spoke with the Lake Whitehurst West Civic League on May 19, 2014. Dr. Atkinson described the environmental changes and increased instance of flooding observed in the region and the initiatives on-going to address these issues. On May 13, 2014, Hans-Peter Plag gave a presentation for the Tidewater Virginia Chapter of the Construction Specification Institute titled “The Built Environment and Local Sea Level Rise: Anticipating Surprises.” The event took place at Clark Nexsen, 6160 Kempsyille Cir., Norfolk. The documentary “Sea of Change” was screened at ODU on April 27, 2014. After the screening, there was a panel discussion. The half hour documentary featuring Larry Atkinson of MARI can viewed on YouTube here. Hans-Peter Plag presented “The Built Environment and Local Sea Level Rise: Anticipating and Preparing for Surprises” at ECOnference ‘14 on April 8, 2014. The event was reported in the press, see, for example, the article in Inside Business. The Hampton Roads Sustainable Living Fair on February 9, 2014 hosted a panel discussion about responses to sea level rise that included Michelle Covi. 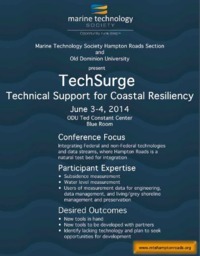 The 3-4 June 2014 “TechSurge” at ODU sponsored by the Marine Technology Society grew into a signature event that has advanced Hampton Roads' collaboration on sea level rise mitigation. 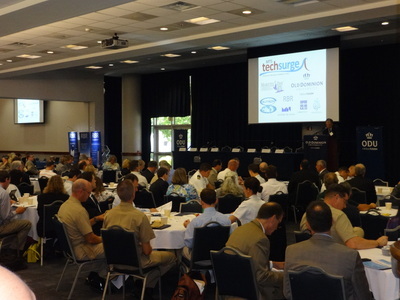 Blending government, industry, academia, and community participants, the TechSurge far exceeded original goals (and set attendance records) while serving as a platform to announce an major “whole of government” pilot project that will address the best way to deal with sea level rise for this region. The program attracted primary players from multiple organizations, to include the EPA Administrator, NOAA's Chief Scientist, Navy Admirals, Senior Executives in myriad positions like the National Security Council, along with many local leaders such as Mayor Fraim of Norfolk. The dynamic agenda included daily kickoffs by ODU's President and Provost, lively dialogs with technical experts, and a panel discussion that helped frame expectations as well as point out gaps in representation that this pilot project must include going forward. ODU's role as facilitator, especially acting through the Mitigation and Adaptation Research Institute (MARI), crystalized nicely while also reinforcing the fact that Hampton Roads is a “natural laboratory” for mitigating sea level rise not just because of the physical events occurring here, but the concentration of nationally important facilities. The interdisciplinary group dispersed with a better collective understanding of how data can better be used to define some of the risks in our future, but more importantly, how all these organizations must collaborate in actions now to best weather the storms ahead. 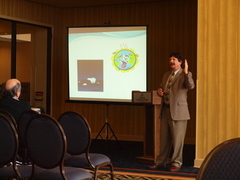 The meeting was opened by Ray Toll, ODU. 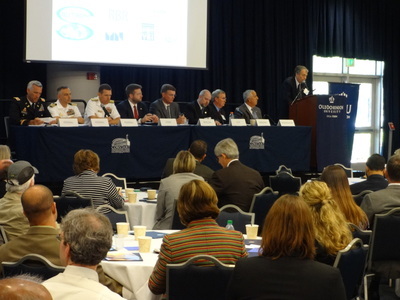 A panel discussion on the first day outlined the scope of the Hampton Roads Pilot Project. 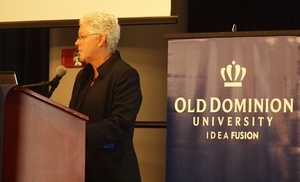 The meeting concluded with a speech of Gina McCarthy, the Administrator of EPA. 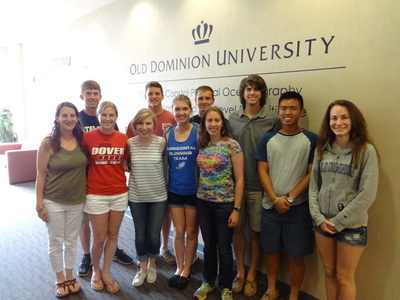 This summer, the Ocean, Earth, and Atmospheric Sciences Department (OEAS) at ODU is hosting nine undergraduate students as part of the Research Experience for Undergraduate (REU) program, funded by the National Science Foundation (NSF). Through a competitive grant process, NSF funds select sites throughout the country in a variety of scientific disciplines. The REU site at OEAS will be unique as students will focus their research around the timely and relevant topics of climate change and sea level rise in a coastal, urban environment. The nine students, all with backgrounds in biology, meteorology, or environmental science hail from colleges and universities throughout the country; Penn State University, Millersville University, Bowling Green State University, Lebanon Valley College, Catawba College, Drake University, Rider University, and the College of St. Benedict and St. Johns University. Through a competitive application process, these students were selected to work one-on-one with experts in the field of oceanography, exposing them to in-depth research focused on climate change and sea level rise. The primary element of the REU experience at ODU will allow undergraduates to experience research while being mentored by research-active faculty members. This will expose each participant to several sub-disciplines in ocean sciences, climate modeling and other fields related to the impact of localized climate change. OEAS faculty who are currently serving as mentors include Alexander Bochdansky, Fred Dobbs, Rodger Harvey, Eileen Hofmann, John Klinck, Margie Mulholland, Hans-Peter Plag, and Richard Zimmerman. Katherine “K.C.” Filippino, a research assistant professor in the OEAS department, is the program director and serves as Co-Principal investigator along with Rodger Harvey, chair of the OEAS Department. Students live on campus, and receive room and board, and a stipend for the 10-week program. Through enrichment activities, workshops, seminars, and volunteer events, students will also learn about scientific communication (with the help of MARI's own Michelle Covi), professional development, graduate school and employment opportunities in the ocean sciences field. The students will benefit from ODU's commitment in OEAS to climate-change research, outreach and education; from a faculty with high standing in numerous oceanography disciplines; and from the campus's proximity to the ocean and bay. Enjoying a sunset at ODU's campus after a busy day. The group is looking forward to ten weeks of rich research experience. The students are visiting Norfolk at a time of many cultural activities going on in areas of Norfolk easily reached from the campus. 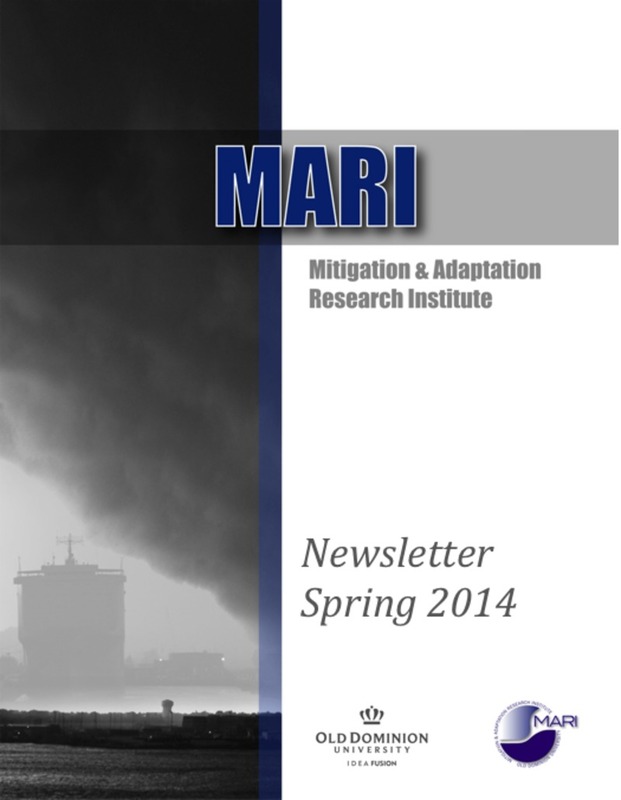 The Mitigation and Adaptation Research Institute (MARI) is partnering with Hampton Roads-based federal, state and local governments, the Planning District Commission, and industry on a two-year mitigation and adaptation pilot project. This project will be developed using a “whole of government” approach to tackling the complex inter-governmental challenges of preparing for the impact of climate change and sea level rise. ODU will take a lead/integrator role in a unity of effort approach that would include all these echelons of government and industries in the Hampton Roads area to collectively address sea level rise vulnerability, and measures for increasing resilience. This project was spawned with the President's Executive Order on Climate Change issued December 2013, which precipitated a search from the White House National Security Staff and Council for Environmental Quality for a regional pilot that could be emulated in other regions. Both the White House and Pentagon have been monitoring ODU's Climate Change and Sea Level Rise Initiative over the past two years, thus ODU was brought into the conversation in February 2014. The pilot will be a two-year effort that will first assess the regional network already in place and then focus on ways to improve upon that network. The first year's effort would assemble a team composed of representatives from federal and state agencies, local governments, and key industries that would work to form a Regional Interagency Task Force. In the first year the planning group would develop a clear mission statement, leadership, coordination and decision-making procedures, communications paths, goals, roles and responsibilities for the Task Force. In the second year, the Regional Interagency Task Force would focus on development of a preparedness and resilience plan for sea level rise, assess decision support tools, and develop proposals for policy and legislative changes that would remove barriers to interagency cooperation and enhance planning efforts. The task force will identify information and analytical support that federal agencies can provide to regional planning efforts. Simulations and table top exercises may be used to develop and test interagency coordination processes and procedures, and identify critical planning factors that should be included in a regional preparedness and resilience plan. The Hampton Roads Mitigation and Adaptation Pilot Project will serves as a model for other community action plans addressing sea level rise. Navy, in particular, has other bases vulnerable to tidal flooding and exacerbated storm surge around the world. Hazards mitigation and sea level rise adaptation measures identified by the Task Force for implementation may be implemented in other regions. The two-year pilot project objectives and tasks will be formally announced and discussed at the June 3 Tech Surge meeting on the ODU campus. More information about Tech Surge and free registration sign-up can be found at http://mtshamptonroads.org/mtshr/?page_id=157. 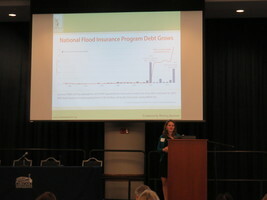 The fifth meeting of the Hampton Roads Sea Level Rise/ Flooding Adaptation forum took place on March 28, 2014. 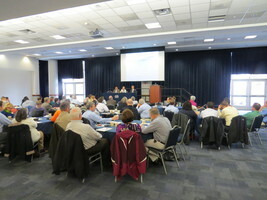 Over 70 people attended the meeting at ODU's Ted Constant Convocation Center. The Forum is a continuing series of meetings bringing together stakeholders in the Hampton Roads region to discuss solutions and best practices for adapting to sea level rise and increased flooding. This project is an on-going collaboration among Virginia Sea Grant, Old Dominion University and the Hampton Roads Planning District Commission. Many of the attendees to the fifth meeting were new to the forum, drawn by the topic of floodplain management. FEMA Region 3 representative Robin Danforth presented information about the on-going Coastal Flood Study that includes Hampton Roads. She demonstrated how the new coastal hazards zones are calculated and directed the audience to the new property locator tool that is available for residents to examine any proposed changes to their flood zone designation. Following Ms. Danforth's presentation, a panel of local municipal staff, Whitney McNamara from Virginia Beach, Brian Swets from Chesapeake, and Robert Tajan from Norfolk, shared their experiences with floodplain management at the local level. Ms. McNamara gave an overview of the process of updating the Virginia Beach floodplain ordinance in 2013 and new special restrictions, freeboard levels and stand-alone ordinance. 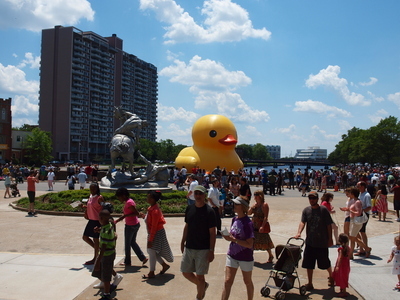 Robert Tajan explained the circumstances under which Norfolk's new 3 foot freeboard building code was adopted and the problems updating an ordinance in a city that is essential built-out. Brian Swets described Chesapeake's new flood ordinance and their experience in applying for credits through the Community Rating System (CRS). CRS was explored in more depth by Shannon Hurst of Wetlands Watch, who summarized the changes in flood insurance laws with the Biggert-Waters, then Grimm-Waters acts. Ms. Hurst's analysis of the number of coastal Virginia communities are participating in CRS and the potential economic, safety and environmental benefits stimulated a lively discussion. Municipalities with experience of CRS explained some of the hidden costs of participation and difficulties working with a program currently undergoing change. Some suggestions, such as CRS regional workgroups, were proposed. The fifth adaptation forum wrapped up with updates and announcements from Jim Reddick, about the Secure Commonwealth Sub-panel on Recurrent Flooding, from Ray Toll about the TechSurge event in June and from Michelle Covi about the development of the Mitigation and Adaptation Research Institute (MARI) at ODU. To view the agenda and slide presentations see here. About seventy participants contributed to the discussions. Shannon Hulst, Wetlands Watch, presented a Community Rating System. 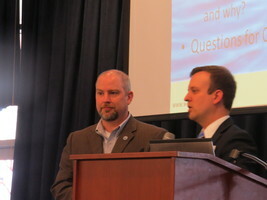 Ben McFarlane, Hampton Roads Planning District Commission (HRPDC), and Jim Redick, City of Norfolk, presented ideas on moving forward and updated to participants on the Recurrent Flooding Sub-Panel and the HRPDC. On Saturday 22 February 2014, ODU's annual United Nations simulation conference featured a workshop on climate change and sea level rise. The event for high school teachers presented major challenges for economic, geographic and social adjustment and American policy-making. Titled “The Touchy World of Climate Change and Sea Level Rise: Natural Science, Social Science, Philosophy and Psychology,” the workshop stressed ways to publicly discuss these sensitive issues without slogans and polemics, and how to teach them to a divided and often skeptical classroom. The annual conference — ODU's largest simulation event — brought together 1200 mid-Atlantic high school students from seventy schools and their teachers for three days in Norfolk's Sheraton Waterside Hotel. The workshop offered the accompanying teachers, mostly high school social studies teachers, a chance to hear ODU experts address a wide range of sea level rise topics. The workshop was co-sponsored by the ODU Model United Nations and AccessEU, a research project at ODU supported by the European Union. To view the agenda see here. 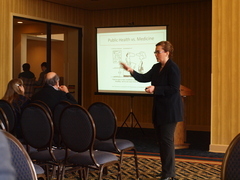 Muge Akpinar-Elci, ODU Associate Professor of Health Sciences and Director of the Global Health Center, talked about the impact of climate change on public health. Glen Sussman, ODU Professor of Political Science, shared his thoughts on climate change in American domestic politics.